Gordon Murray has unveiled what he claims is the world’s most efficient electric car, the Gordon Murray Designes T27, a battery-powered version of his revolutionary ultra-compact T25 city car. Though it's just 2.5 metres long, and weighs less than 700 kilograms ready to go, it can carry three adult passengers. See pics of the Gordon Murray Designs T27 The car, which introduces some small body changes likely to feed into the original design, is much more than a concept, Murray insists. It could be on the market in little more than two years, he claims, and would cost £14,000 to £15,000 in the showrooms, not counting the government’s present £5000 subsidy on electric car purchases. Developed over 17 months, the T27 is part-funded by a £4.5 million grant from the Technology Strategy Board. Its 33bhp electric motor and single-speed gearbox are both developed by Zytec, the UK race electronics and green technology company which has already done much work on the electric Smart, and are unique to the Murray project. Production for the T27 (and T25) continues to depend on Murray’s company attracting clients willing to invest not just in its car designs but in its revolutionary high-efficiency production process, called iStream. Murray says he is currently in serious talks with three potential clients, one in the UK, one in Europe and one “on the other side of the world”. He believes an announcement from the European investor could come as early as the end of the year. The T27 is much lighter than most electric cars, weighing just 680 kilograms at the kerb, including battery. Its lithion-ion battery pack takes only 4.5 hours to acquire an 80 per cent charge and it has a ‘real life’ range of 100 miles. It also accelerates from 0-62 mph in under 15 seconds (and 0-30 mph “uncomfortably fast”), with a top speed governed at 65 mph, to protect battery charge. The T27 will make its debut on public roads in this year’s RAC Future Car Challenge, which runs from Brighton to London on 5 November. Since we heard from this cute urban runabout. Basic problem might be that automakers are not inclined to produce something that "has not been invented themselves". So, you need another player, a company that has the ambition to jump into this market that has been dominated so far by companies that are conservative at heart. 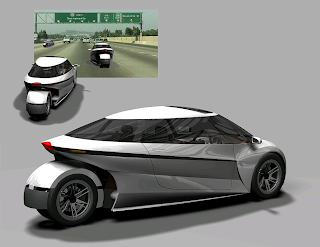 Toyota's i-Road tilting three-wheeler shows promise though, as well as the newisetta.com concept, shown below. Space efficiency seems to be the key word. Bring them on I'd say. Wow, I am loving this electric car, its so unique. The car seems very cozy, but it is too tiny grabmyessay.com review. I don’t like the factor that only one person can travel in it, and that is the only negative thing about it. This is such a nice car model. electric T27 have such best features. These attracted others to copy their vehicle. The features of this car contain automatic opening and not waste anymore place of this car. The method is very clear and makes very beautiful. best ayurvedic treatment in Kerala interested for know more about this car and upcoming features also. I think you should keep update articles as early as possible.